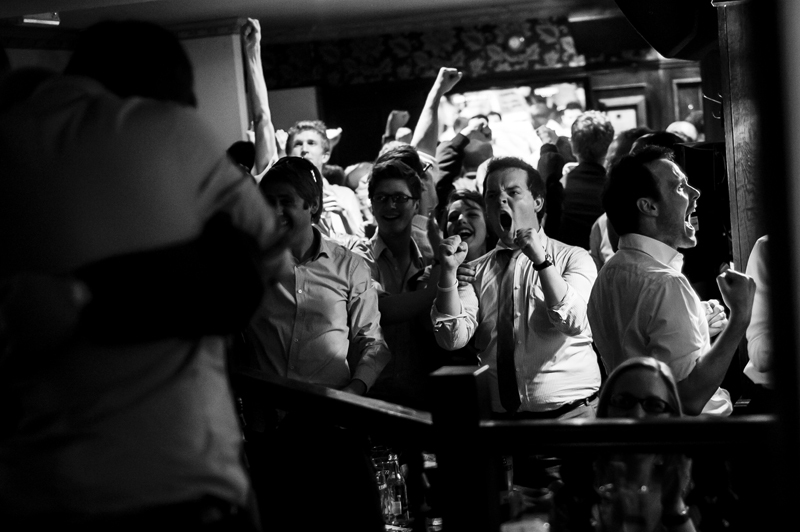 Manchester City fans celebrate a goal against Manchester United at the Blue Anchor Pub in London, England, April 30th, 2012. Manchester City won the potential league championship derby match 1-0. After six or so months not doing any sort of photo-journalistic work I started to get an itch. Missing the different mode of thought that goes into photojournalism, the fast paced reactionary story telling in one image opposed to the slower conceptual documentary story telling that goes into going back to art school, I been waiting patiently for something interesting to cover to scratch that itch. and the scratch came in the form of a basement of a pub packed with die hard Manchester City fans frantically watching the most critical match for them in 43 years. Being 3 points back of the number one spot for the league championship to cross town rival and English Premier League version of the New York Yankees Manchester United to their New York Mets. Having a better goal differential, needing a win to edge pasted Man United the drama was set for a derby match that would decide the league title. Considering how significant this match was for Man City I went to one of their London pubs to cover reactions of the game. As you would imagine I ended up wedged in the corner of a pub basement that was more dungeon than anything else pointing a camera at 200 or so anxious fans watching a projector screen, their hearts on their sleeve every heart wrenching second of the match. Even though I much prefer tears over cheers Man City decisively won the match 1-0 putting them ahead of Man U with two more matches left in the season and the league championship within grasp.